We weren’t sure that we were going to make it to Bratislava, but ultimately decided it was worth it. We needed a place to stop over on our way from Zdiar to Budapest, and Bratislava was on the way. Also, we read up on Bratislava and it sounded like it had plenty of cool sights of its own! Airbnb Apartment – We were lucky to find a convenient, inexpensive Airbnb. We were about a 15 minute walk to the east of Old Town. We enjoyed our apartment as it was on the first floor and had all the conveniences we needed, including a washer! The washer was a bit of an adventure though. We couldn’t get it to work, and ended up having to call our host. It turned out that some work had been done in the room and the water was turned off. It was hard to figure though because the sink was in the same room and the water to it was fine, but eventually managed to get it going. Our host thoughtfully provided a drying rack, iron, and hair dryer! He also included fruit and supplies for breakfast! Free Walking Tour – We feel like we’ve become pros at the free walking tour. What a great thing to do in many of the cities we’ve visited! We like to do the tour on our first full day because they often give us a good lay of the land and help us orient ourselves. Like many of the others, our guide was great and gave us a good overview of the city. We enjoyed this particular tour because our guide gave us a little bit more of the recent history (since communism) and a bit of the current political situation. Namely, she explained that the country was moving in a capitalist direction and many of the young people agreed. She did state that there was a significant population of mostly older people who believed that they had been better off during communism. Their unemployment rate in Slovakia is high, mostly in the country. In Bratislava itself, it was not that bad. We started out in the Hviezdoslavo Square, admiring the Carlson hotel and then the Opera House. We then headed into Bratislava’s small Old Town. We stopped by the statue of “The Watcher” peeping out of a manhole, then to the main square, where we found a cannonball embedded in a clock tower. We walked out of Old Town through the St Michael’s Gate (and found the second narrowest building in Europe. which is now a Kebob shop). Our next stop was near the Trinitarian church where we also looked up at the castle but did not walk to it. We then walked past the Presdient’s residence and the Slovak National Uprising square. We stopped at the Art Noveau “blue church”, then our final stop was at a small square where a communist uprising occurred. Walk to the Bratislava Castle – The Castle is up on a hill overlooking the town of Bratislava. It was destroyed in the early 1800s by fire and then was not restored until 1953, during communism. Due to this, it was not restored lavishly and today is pretty simple. It still is impressive and offers great views of the rest of the city. Zumba – We were so excited to participate in our second Zumba Round the World class. Read about it here! Slovak Pub – We followed a recommendation and visited the Slovak Pub for dinner our first night. We enjoyed the many rooms relating to Slovakian history as well as the delicious food. 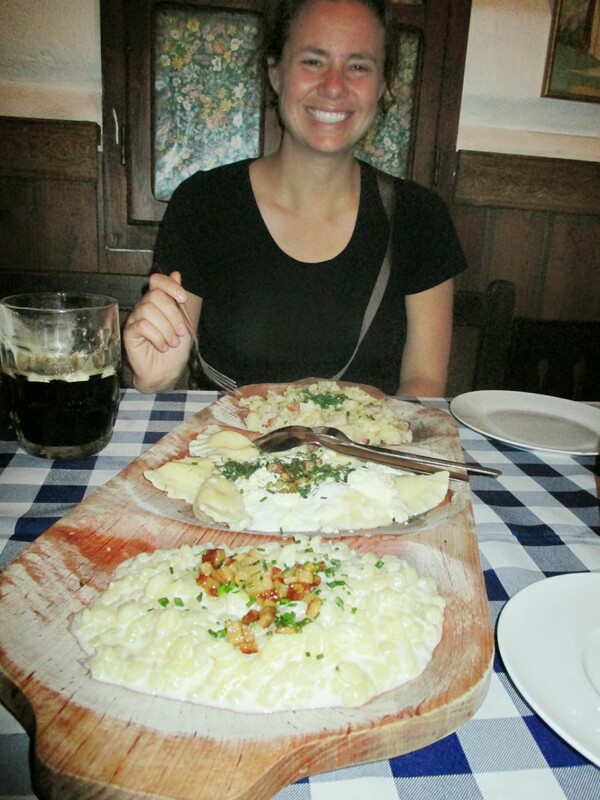 We ate a combo platter of the Slovak national dish of sheep cheese halusky, sheep cheese pierogi, and cabbage halusky. Halusky is small thick noodles, kinda like gnocchi. Here in Slovakia, they are normally covered with cheese and bacon. As a dessert, we had sweet dumplings filled with blueberry and covered with cocoa powder- YUM!